Pysanky on Paper : An Activity Book for Children introduces the art of colorful Ukrainian pysanky eggs to children aged 2 to 12. The activities in the book teach symbolism, coloring, drawing, reading, writing, math and science through pysanky. It also includes activities, stories, puzzles, games, art projects and a bibliography. 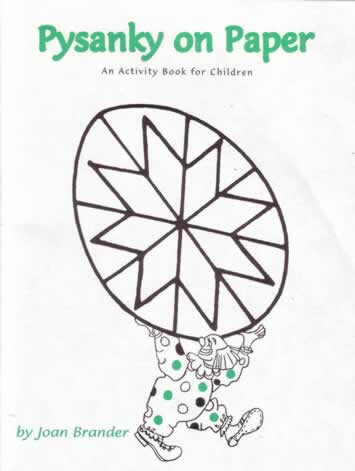 Select this link to watch a Pysanka Power Video Clip that flips through the pages of Pysanky on Paper - An Activity Book for Children. See the book format, pages, colourful cover, and contents of pysanka designs featured in this book. 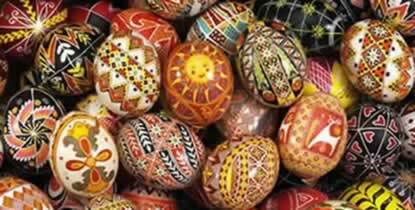 Pysanky are colorful and intriately designed Ukrainian Easter eggs. This activity book explains what pysanky are, what their designs mean, and how they were used historically. There are several beautiful examples of traditional designs, which children are encouraged to color or paint. There are also word puzzles, activities that incorproate reading, writing, science, and math; suggestions and techniques for dying Easter eggs; and games to play with colored eggs. Add this book to your shopping cart now! Use the "Notes" section in your online checkout process to request that your book be autographed by the author or a personal greeting written.